Been researching the hell out of Stingers the past few months and frustrated that the local dealer never seemed to have any on the lot to test drive. I finally searched some dealers in nearby cities and got to test drive one last Thursday and decided to pull the trigger, picking up a blue GT2 on Saturday. 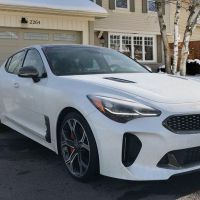 Running the lease options on their site and the Kia build your own, I found that a 36 month (only!) lease came with a manufacturer incentive of $7100 off the price, or about 15% of a GT2 AWD sticker price. That combined with a military discount and $16K trade-in got a me a pretty sweet low monthly payment. Main disappointment is no phone app integration like remote start/lock/unlock, but very pleased overall. I decided against a Tesla for now as it doesn't have some of the Stinger's features such as HUD, 360 view and Android Auto, plus my area is not friendly for plentiful charging options. We'll see in 3 years when the lease is up how Tesla and my town shape up. Congratulations on your purchase! Welcome to the forum and let’s see some pics!